The floor covering has gone and will need replacing. Exterior has a few small dents and dings but nothing major. Could make a nice summer place on the lake,guest house or your Home. Needs some repair to the kitchen ceiling after a leak. 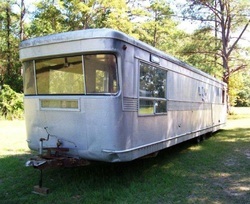 These are nice Vintage park model trailers that are becoming more desirable everyday.